What’s the secret to stellar dental health, anyway? There are many ideas floating around about what’s the magical formula that produces the beautiful, healthy teeth we all want. Aside from regular dental cleanings…..what? Is it brushing your teeth a particular way or a certain number of times per day? Is floss the answer? Maybe, fluoride is what makes the difference? The truth is, how to keep my teeth clean is simpler than you’d imagine. You may have learned about indigenous tribes who enjoyed healthy diets and equally healthy teeth. When those same tribes were introduced to a Western diet, what followed was disease! What you eat is the most important decision you can take to maintain top-of-the-line dental health. Avoid artificial additives at every opportunity: that includes colors, pasteurized dairy, flavors, etc. Do not eat foods that you know have pesticides and preservatives. The best diet has whole foods, especially organic fruits and vegetables! An ancient Ayurvedic practice from Hindu medicine, oil pulling is gaining speed in the west as we learn of its remarkable healing effects. Before you eat or drink in the morning, take a spoonful of sesame or coconut oil and swish it around your teeth for 15 to 20 minutes. This is a great way to aid gum and tooth healing. It is also said that this practice pulls toxins out of the body, improving overall health. What is the most effective way to improve dental health in your tooth brushing? Few of us learn the perfect way to brush from our parents. Many patients are under the impression that the brisker and longer, the better. If you’re in good health, then rigorous brushing will stimulate remineralization and blood flow. But if you aren’t, then hard brushing will tear up your gums and strip enamel from your teeth. So be sure that you’re caring for your teeth in a way that corresponds to YOUR tooth health, not anyone else’s. Be sure to use a circular motion when brushing teeth and gums, using a soft brush. And don’t forget to brush your tongue and the roof of your mouth! Though the dental profession has been pushing flossing for over 20 years, it’s been said that only about 5% of the population is doing it properly, according to Dr. Nigel Carter of the British Dental Health Foundation. Perhaps that’s the reason why many people who are flossing are only getting a minimal benefit. The purpose of flossing is to remove plaque, which is a film of bacteria that forms on the teeth. If not removed by brushing, plaque irritates the gums, causing tooth recession. However, effective flossing will reduce both cavities and gum disease. How to do it: hook the floss like a C around the tooth, so that it scrapes out the plaque between the contact points of the teeth. You should try to clean the sides of both teeth in a single tooth gap. Then, be sure to clean that section of the floss or move to a new section of floss so that you are not re-inserting the plaque into a different part of your mouth! It’s very feasible to implement small changes in your tooth care regimen to improve your overall dental health. Depending on the state of your teeth now, you may or may not need to take extra care. 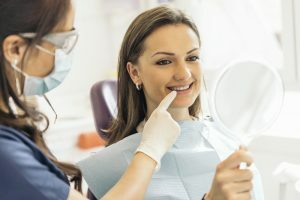 But by perfecting your basic tooth care controls, you can do your utmost to ensure that your dental cleaning sessions are uneventful (what we all want!). To learn more or to get in contact with one of our dentist professionals at Penn Dental Medicine, please do this short form or call 215-898-8965 today.